Do not give out personal information to anyone you do not know. 2-1-1 ORANGE COUNTY - Free, 24-hour information and referral helpline linking them to thousands of local health and human service programs in Orange County, CA. 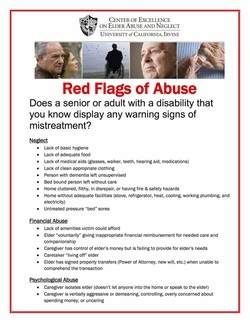 ADULT PROTECTIVE SERVICES - The county agency whose mission is to prevent or remedy neglect, abuse or exploitation of adults who are unable to protect their own interests because of age or disability. 24 hour hotline: 800.451.5155. AGE WELL SENIOR SERVICES - (Formerly South County Senior Services) Provides lunch programs, meals on wheels and low-cost transportation to medical appointments. ALZHEIMER'S FAMILY SERVICES CENTER - At its facility in Huntington Beach, the agency provides community and family education, caregiver support groups, and day services. Call 714.593.9630. AMERICAN BOARD OF HOME CARE - An Orange County trade association of home care agencies, the ABHC certifies that companies carry Worker’s Compensation Insurance and only use care givers who are employees, not independent contractors. CENTER ON ELDER ABUSE AT UCI - A local and national resource whose goal is to support the elimination of abuse, neglect, mistreatment and exploitation of seniors on every level. CITY OF DANA POINT - SENIOR SERVICES - Dana Point Senior Center, 34052 Del Obispo Street - 949.496.4252. CITY OF LAGUNA BEACH - SENIOR SERVICES﻿﻿ - The City's Community Services Department arranges many classes and activities for seniors through the Senior Center Coordinator. CITY OF NEWPORT BEACH - OASIS SENIOR CENTER - 800 Marguerite Ave, Corona Del Mar, CA 92625 - 949.644.3244. COUNTY OF ORANGE OFFICE ON AGING - The lead advocate, planner and facilitator for all older persons and their caregivers in Orange County. COUNCIL ON AGING - SOUTHERN CALIFORNIA (Formerly Council on Aging Orange County) - A nonprofit agency whose services include: FAST (Financial Abuse Specialist Team); HICAP (Health Insurance Counseling and Advocacy) assistance; and links to community service providers. A State-certified Long-Term Care Ombudsman protects the rights of those living in nursing and board and care homes in Orange County. LAGUNA BEACH COMMUNITY CLINIC - 362 Third Street, Laguna Beach CA 92651 - 949.494.0761. Medical, dental and health education services to low-income and uninsured residents of Orange County. LGBT CENTER OC - Services and advocacy for the Orange County Lesbian Gay Bisexual Transgender and Queer/Questioning communities, including their seniors. OLLI - IRVINE EXTENSION/OSHER LIFELONG LEARNING INSTITUTE - A learning community of those who enjoy the challenge, stimulation and quest for continued learning. ORANGE COUNTY TRANSPORTATION AUTHORITY: ACCESS - ACCESS is OCTA’s shared-ride service for people who are unable to use the regular, fixed-route bus service because of disability. These passengers must meet the Americans with Disabilities Act (ADA) eligibility criteria. Eligibility Help Desk Local number: 714.560.5956 & TDD 714.560.5474. ORANGE COUNTY VETERANS SERVICE OFFICE - Provides free benefit claims counseling, information and referral assistance to veterans, their dependents and survivors. The care managers at the Susi Q can help you access this federally-funded service. AARP - A nonprofit membership organization of persons 50+. 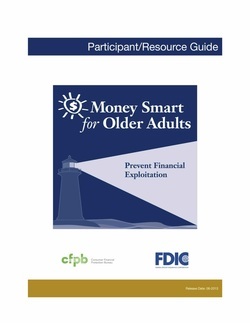 with comprehensive resources for older adults. The AARP Bulletin has articles on social security, Medicare, health and issues related to retirement, pensions, benefits. AGING WITH DIGNITY - Helps families plan for the kind of care they want during their last days. Its FIVE WISHES document is in more than two million homes and distributed by more than 5,000 organizations. BENEFITS CHECKUP - A SERVICE OF THE NATIONAL COUNCIL ON AGING - This is the nation's most comprehensive Web-based service to screen for benefits programs for seniors with limited income and resources. CALIFORNIA DEPARTMENT OF AGING﻿ - Administers programs that serve older adults, adults with disabilities, family caregivers, and residents in long-term care facilities. CALIFORNIA HEALTH ADVOCATES - Accurate and unbiased information about Medicare benefits and long-term care for people who live in California. CARING FROM A DISTANCE - A national non-profit that provides guidance and contacts for long distance caregivers with frail and aging family members. CHOOSING WISELY - Aims to promote conversations between physicians and patients by helping patients choose care that is supported by evidence, free from harm, and truly necessary. COALITION FOR COMPASSIONATE CARE OF CALIFORNIA - A partnership of regional and statewide organizations, agencies, and individuals working together to promote high-quality, compassionate end-of-life care for all Californians. COMFORT MATTERS - A dementia care education and research program dedicated to improving the quality of care and life for people with dementia. COMPASSION & CHOICES - A nonprofit that supports, educates and advocates for improved care and expanded choice at the end of life. DESIGN ALLIANCE FOR ACCESSIBLE SUSTAINABLE ENVIRONMENTS (DAASE) - A diverse organization of compassionate individuals, businesses and charitable organizations committed to the design of safe, secure, sustainable homes and cities. FAMILY CAREGIVER ALLIANCE - Supports and sustains the important work of families nationwide caring for loved ones with chronic, disabling health conditions. HEALTH IN AGING - Created by the American Geriatrics Society Foundation for Health in Aging to provide up-to-date information to consumers and caregivers. MEDICARE - The official site for people on Medicare. A little dense, but comprehensive. NATIONAL ALLIANCE FOR CAREGIVING - A non-profit coalition focusing on issues of family caregiving. Has an online tool to help you coordinate care and much more. NATIONAL COUNCIL ON AGING - Dealing with an ongoing health condition? These free workshops can help you get the support you need and find practical ways to deal with pain, fatigue, and stress. NATIONAL PARKINSON FOUNDATION - The local Parkinsons Association of Orange County offers support groups, a therapeutic singing group, and a fitness class. OC website: www.paocinc.org. 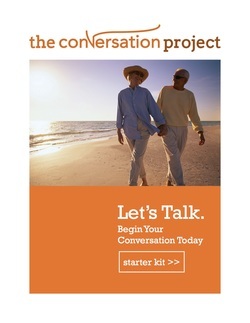 NEXT STEP IN CARE - Easy-to-use guides to help family caregivers and health care providers work closely together to plan and implement safe and smooth transitions for chronically or seriously ill patients. PATIENT ADVOCATE FOUNDATION - Provides mediation and arbitration services to remove obstacles to healthcare including medical debt crisis, insurance access issues and employment issues for patients with chronic, debilitating and life-threatening illnesses. ROAD SCHOLAR - Formerly Elder Hostel, and still the not-for-profit leader in educational travel for older adults. SCAN FOUNDATION - Devoted to transforming care for older adults in ways that preserve dignity and encourage independence. SENIOR PLANET - A community of older adults with a focus on technology’s role in helping adults 60 and up connect, stay healthy and enjoy life—with attitude . VA CAREGIVER SUPPORT - The Veterans Administration has programs in and out of the home to help veterans and their caregivers.